Every pet owner knows that chances are, their pets will not outlive them. 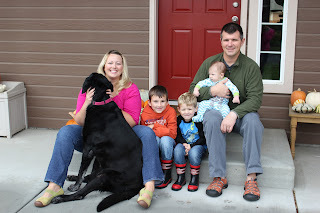 When we made the decision to adopt an eight year-old dog, we did so knowing the risks. Honestly, when we first got him I was far more nervous about my ability to not be crawling out of my skin at the thought of pet hair all over our house than I was about, what seemed like, the very far-off prospect of dealing with his loss. I was secretly relieved when both the vet and trainer said that it would not be good to have him up on the furniture or bed because it would be hard on his joints. I will never be the type of pet owner who spoons their dog under the covers in bed. And I will always be the kind who throws up in my mouth a little bit when other people talk about doing it. However, I was pleasantly surprised at how quickly the pet hair (aside being a lot of work to keep up on) was just a part of him. And, oh how I loved him. 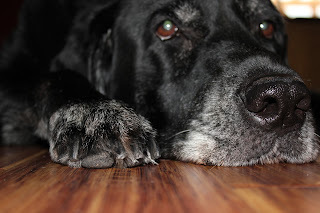 I'm sitting here just three hours after getting home from the vet's office where I sat and stroked that huge, lovable, loyal (and yes, a little stinky) head for the last moments of his life. With Jack in the ergo sleeping, the boys at school and J at work, it was as it is the majority of the time; just me and D, also affectionately know as Sir Licks A Lot, His Nervousness and Our Dailey Bread. On Thursday, when I dropped him off at the vet, I was just waiting to get a phone call saying that he'd swallowed an entire lego village (even though he never ate the kids' toys) or he'd somehow eaten a cloth diaper (even though there were none missing) because there had to be a silly explanation for his random vomitting and sickness. Sadly, there was no silly explanation, just the one you don't want to hear. As I stood on a Friday afternoon stirring a giant pot of soup, I was digesting the words that came streaming into my ear; poor prognosis, risk of ruptured spleen, tumor, cancer-the one I wasn't quite ready for came along. Euthanize. What a cold, hard word. J and I decided to bring him home for the weekend, and I'm so glad we did. It gave us all a chance to digest the news, as much as was really possible it's still so surreal, get pictures, give him some love and say good-bye. This morning I loaded him into the car when I took the kids to school, had them give him a squeeze and a kiss as they each got out, and drove with dread to our appointment. As I walked back in the house afterward, I looked around and realized just how much our home centered around his being here. Then, when Jack went down for his nap and the house was just too quiet, I turned to my friends Ben & Jerry and consoled myself with some S'Mores ice cream, because I had almost forgotten to be an emotional eater. I'm not sure how long it will be before I feel ready to have another pooch in our lives, but I know that it will happen. I also know that every other dog we have will be compared to him, which isn't a bad thing, but it would be a sad thing right now. 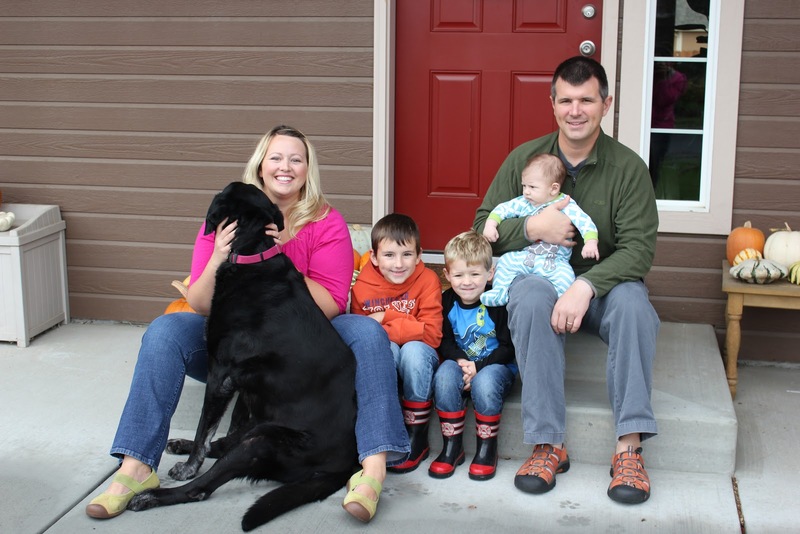 Thanks sweet D for giving H a best friend in a new town, and our whole family the chance to love you for two years. No, I haven't suddenly become a crazy baseball fan. But this post is related to socks, and cursing, so there you have it. I'm the kind of girl who has some turquoise splotches on her beige carpet because I don't use silly things like drop cloths while paintings. I also never use a 'lifeline' in lace knitting, which makes frogging back tricky at best. Once I correctly navigated the first two repeats of the lace chart (after I ripped back and started over for the correct size of course) I didn't need to have the pattern with me anymore, which meant I could work on the socks while waiting in the pick-up line at school, while watching The Colbert Report or while pretending to supervise my big boys at the park. 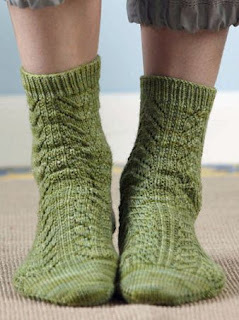 After I got going, I was at the heel turn before I knew it and prepped to attempt my first short row heel with wrap and turns (abbreviated WNT). Short row heels are not my favorite because they always end up a little wonky. However, since this is a knit along I decided to play nice and work the pattern as written. A fellow knitter linked to a youtube tutorial by Cat Bordhi,* which shows a clever way to conceal the wraps when they're knit together. My heel was looking pretty good until I realized that in my tired state, I'd 'unwrapped' stitches that weren't actually wrapped. I considered ripping back and doing it again, but it looked like these socks were starting to turn into a practice pair, much to my dismay. The foot went super speedy, thanks to my new 8" addis (who knew they made them that short?! It's circular sock knitting to the nth degree of ease!) and brought me to the toe. I no longer cared about playing nice, because I didn't want my toe to look as wonky as the short row heel, so I proceeded to do my normal toe. Then I put the sock on and...it was too short. Blerg. I took the 80 hours it takes to thread your needle back into the patterned row just before the toe so that I could work another round of the pattern. I grabbed the yarn and ripped back. To find that my needle was one row off on half of the sock. So I took the needle all the way out and started to tear out my stitches. Round after round of work was wound back onto the ball of yarn and I planned to just start the sock over again. It's not like I'd spent precious time on that sock. No, it would all be fine. I was winding faster and faster as my frustration mounted until...I realized that when I came to the heel, the stitches would be split between instep and heel stitches and I'd be able to easily find my place...plus have the chance to redeem my heel. Yes, yes, that's what I'd intended all along! Who wants a sloppy old heel anyhow? Not me, certainly. After watching the tutorial again and being sure to work the heel in the daylight hours, with big boys at school and the babe asleep for limited distractions, all of a sudden it was 2004 (come on Red Sox fans, I know you'll be with me), the heel was turned and it was on to the foot. Success. *Funny story, I never saw the part 2 until writing this post, which shows how to conceal the wraps correctly for the purl side. Needless to say, my second sock will have an even spiffier heel. 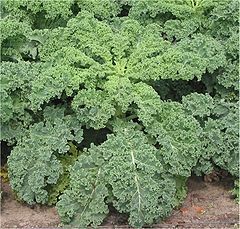 Every food blog and health site you look at today will have at least one recipe that involves the use of kale. A hearty, deep rich green that comes in a few different varieties, it's full of beta carotene, Vitamins K and C and a reasonably good source of Calcium. Additionally, it contains sulforaphene which is a chemical with anti-cancer properties; especially when chopped or minced. However, if you've ever tried to eat it raw, as in a salad or just popping a leaf in your mouth, you better have super-saliva and even then you'd be chewing for awhile. Even though I've read about it everywhere, I had yet to try the chips and had only had kale itself when at a friend's house they used it. We went to Portland to cheer J on in his first full marathon a couple of weekends ago, so my girlfriends and I got the fams together for a potluck and one of them brought a kale salad. When she said it was kale, in my head I thought-how in the hell long am I going to have to chew to get that down?! I was so wrong. First, the leaves were cut super tiny, maybe half-inch pieces. Secondly, the dressing was uh-mazing, and it was wet enough that it helped with the robustness of the kale. We were having chicken tacos, so I took a serving of the salad and put it on the tortilla, then added a dollop of sour cream and some of the chicken. Wrapping up the whole she-bang, the kale added a great crisp texture without being hard to manage. I had seconds with just the salad and it was so good. I had to have the recipe. When we got home, I was going through H's school backpack and found the 'Nutrition Nuggets' newsletter that gets sent home each week. On the front page was a recipe for kale chips. Okay, okay, I get it-I'll incorporate kale into our menu. I set out to a market near my house that I've never been to even though everyone raves that it has the best produce in town. When I got there I found that not only were they right about the produce, but that this place was bulk bin heaven! So, in addition to two big heads of curly kale, I also ended up at home with a bag of cherry yogurt covered pretzels and some banana chips for fun after-school snacks. This weekend was J's monthly drill, which means I'm a solo parent each month for at least a weekend (in addition to his normal odd schedule), so I decided to try both kale recipes. The kale chips took less than 25 minutes from start to finish, including baking time. While I really liked them, I had my kids try them and H's verdict was, with a touch of disdain, 'this tastes like salad.' Um, because it is. I took a gamble and used a big chunk that filled my palm, second guessing myself about five times before I just hit the pulse button on the food processor and it was perfection. For lunch, I filled my plate with the salad, and a slice of crusty french bread-At dinner, I fed the kids and got them to bed then assembled a wrap made with a slice of roasted turkey breast and the salad. You'd think I'd be sick of it, but I had the same wrap for lunch today. This morning as I was folding the gynormous pile of laundry that I washed and dried yesterday, I was listening to Rachel Ray (because I have developed issues with watching her overacting, it's the perfect show to have on in the background-great ideas, obnoxious hand gesturing. Also, while I know she's made a lot of money on her cook and bakeware, the shapes seem counterintuitive and horribly impractical for actual use and service. There, I said it.) and she made a lentil soup with sausage and kale for her segment on cooking for the week. That sounds like a perfect hearty fall soup (thank god, she didn't call it a stoup, or I'd have turned the channel before I saw how delicious it was) to serve with a loaf of warm beer bread on a busy school night. As the food processor is going, drizzle in 1/2 c. of olive oil, then pour the whole mixture over the kale salad and toss so that the entire salad is generously coated in the dressing. This salad holds up well and is actually better after being dressed for at least an hour. Please note: this is not a first date salad. Nor is it a 'let's get busy later' salad. In addition to being ginger and garlic-tastic all the hearty greens make for some interesting GI issues, so Jared is probably glad he wasn't here last night anyhow. In case you wanted to know. This week I purchased a half-box of organic emperor plums through a facebook group for local produce and gardens. People post their abundance, and you have the chance to buy fairly inexpensively before it's going, going, gone. I clearly had no idea how much a half-box of plums would be. Nor do I have a cache of plum recipes that I've been dying to use. Or really even know how to process plums, but that's just how I roll. When I met the owner she told me that she'd given me more than half a box because they were getting pretty ripe so her husband picked extra. Sweet, now I not only had an abundance, but a pretty tight time frame to use them before they started to go bad and I'd wasted them. Last year, I got a beautiful box of peaches with the intent to can them and went back about a week and a half later to look at them in the garage and found a goopy, moldy mess...I did not want to repeat that mistake. Pinterest is a girl's best friend, so I entered 'plum dessert' into the search box and saw that Smitten Kitchen had posted a Plum Kuchen recipe. I knew I'd heard my husband talk about kuchen as a treat from his childhood, so I mentally filed that one away. My neighbor suggested that I dry some, which would be awesome if I had a food dryer. Luckily, another neighbor of mine did, and graciously let me use it. Since these are gigantic plums, I could only use every other rack, so after filling the dehydrator I still had a lot of plums left. This box of plums was a like a giant plate of spaghetti-no matter how many I used, there seemed to be the same amount left. Let's hope these taste better than they look! I processed several of them in boiling water and removed the skins and pits to puree for baby food. It's just four short months until we're back into the world of introducing solid foods, and I figured we could also use the puree in smoothees. In order to store it easily, I filled paper cupcake liners with the puree on a jelly roll pan and then froze them. Once solid, I removed the paper liner and put the puree discs in a gallon ziploc bag. While I was elbow deep in plum goo, my husband said 'You could make kuchen!' I told him about the recipe I'd found and he looked at it to confirm what some of the comments had already revealed; this was not the traditional kuchen that people from middle america would call their own. After googling custard kuchen we found a blog called Through the Garden Gate, which specified a German-Russian kuchen, and it was just as my husband remembered. A yeast dough crust pressed into a pie plate, layered with fruit and then a rich custard gets ladled over the top, sprinkled with cinnamon and baked to golden perfection. In addition to the plums, I had enough rhubarb from the crazy starts that took off immediately that I could make a rhubarb version as well. The dough has doubled-I used a wooden spoon to mix it, because you just have to make sure all of the flour is moistened. Four plum and two rhubarb...I think next time I'd use more rhubarb, but the plums were perfect! The recipe turned out great, even though it was short on direction-for example, I've never cooked a custard on the stovetop before, so I didn't know to what thickness I should be stirring it before removing from the heat. Mine wasn't thick enough because I had to bake the kuchen for an extra ten minutes before the custard was set. However, the desired result was achieved, and my house smells like rich, eggy french toast. What was the verdict? I thought they were delicious, but they weren't exactly the custard kuchen that J remembered from his North Dakota boyhood. Not that he was unkind enough to tell me that after I'd spent the better part of a day researching and trying to recreate his childhood memories, but whatev', a girl can tell. I've recruited recipes from his aunt and sister so that I can try, try again. After, that is, we consume the FIVE desserts that this produced. Thank god for that garage freezer! As for the plums in the food dryer, I was kind of over the quiet whirring and they were fairly dry, so a big portion of them went into the freezer, and the rest will be eaten over the next couple days. I don't know if I'll ever perfectly replicate the kuchen. I know my dad still waxes poetic over his mom's apple butter, even when he tastes a batch made from the same recipe. Have you ever tried to re-create a childhood favorite for your beloved? I'd love to hear about it! Since I'm all caught up in my knitting queue (who'd have ever thought I'd say that?! ), I started to make a holiday gifting list. There are a few people I'd love to make a pair of socks for, but I wanted them to be something other than a standard pair of socks. Serendipity intervened and my inbox had a message from Knitting Daily. The next knit-along was going to be a pair of socks and the poll was open to vote for the pattern. I cast my vote and voila-one week later the pattern I wanted won, so I made my purchase, chose my yarn and logged onto the forum. 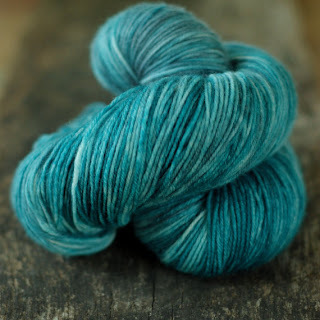 I am so drawn to teal right now, so I immediately thought of this stashed yarn. I must admit that I really don't like that song...but it fit, so I gratuitously used it anyhow. And now it will be in my head for the rest of the day. With that completed, I got to pick a new project from my ravelry queue. A new Pepperberry Knits infinity scarf/cowl pattern had me at hello, so I cast on with some bulky wool/acrylic blend that I had on hand. In a cool seaglass blue, it knit up really quickly and with great stitch definition. I knew that I'd want a rainbow of these cowls. Dying to make Ramona your own? You can purchase her in my etsy shop, and she'll be on her way to you in a jiff! I hope to get a license to sell the Poppy cowl soon, so stay tuned!